Summer days at the Y’s Camp Ponkapoag in Canton are filled with traditional camp activities, including arts and crafts, hiking, and swimming in the outdoor pool. This summer, thanks to a $10,000 grant from Boston Financial Data Services, campers will also take part in a unique learning experience. For the past four years, 65 students from five underperforming Boston Public Schools (BPS) have participated in the Summer Learning Project (SLP). SLP is a partnership between Boston After School & Beyond, BPS and leading funders and nonprofits that works to understand the best approaches to reducing summer learning loss. Research shows that two thirds of the achievement gap between low-income students and their higher income peers can be explained by unequal access to summer learning. Students in the SLP participate in formal English/lanugage arts (ELA) and math curricula throughout the day. This instruction is led by certified Massachusetts teachers. These enriching lessons take place outdoors and utilize the natural surroundings of the Blue Hills to provide hands-on learning. In between the ELA and math sessions, the campers join in more traditional camp activities such as hiking, health and wellness, team building, swimming, challenge courses, and the arts. 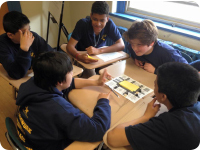 According to evaluation results conducted by Boston After School & Beyond, last summer these students demonstrated increases in ELA (7.7%) and math skills (13.6%). 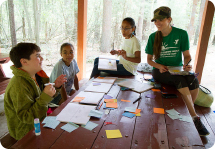 Boston Financial Data is helping to underwrite the costs of SLP so that Y campers continue to learn, grow and thrive over the summer months. In addition, their employees will donate over 300 hours cleaning and maintaining the grounds of Ponkapoag so that the camp is ready to welcome over 200 campers this June. According to a 2011 study by the Pew Research Center, 1 in 3 teenagers have been the victims of cyberbullying. Cyberbullying is the willful and repeated act of harming others electronically (through email, instant messaging, Web sites, chat rooms, social networking sites, cell phones and other electronic means). The consequences of cyber bullying can be far-reaching. Victims may experience low self-esteem, poor academic achievement, difficulty making friends, loneliness, depression, and suicidal thoughts and tendencies. That is why ending cyberbullying is a focus of the YMCA’s teen programs. Through a partnership with the Edwards Middle School in Charlestown, YMCA staff are teaching the Y’s cyberbullying prevention curriculum to 108 8th grade students as part of their social studies class. Through this initiative, staff are equipping students with the skills to treat others respectfully using cyber technology; providing students the tools to get help if they are cyber bullied; and supporting students to work in their schools to help develop school wide policies and procedures. The rain and cold weather did not stop the YMCA’s four-member marathon team from realizing their personal goal of completing the Boston Marathon last month. In the process, they collectively raised over $46,000 to support free YMCA teen programming throughout Greater Boston. Congratulations to our marathon team and thank you to everyone who supported them. CAN EXERCISE HELP YOUR JOB? There are numerous important physical benefits associated with regular exercise: it lowers your risk of heart disease, Type 2 diabetes, and some forms of cancer while strengthening your muscles, bones and improving weight control and sleep. Still, the majority of adults in the US still struggle to meet exercise recommendations such as obtaining 150 minutes per week of moderately vigorous exercise like brisk walking. Yet, if someone were to invent a pill that provided all of the benefits of exercise, many Americans would likely find the time to stand in line 150 minutes per week to get that pill. Perhaps part of the challenge for people is that it takes time to realize some of the physical benefits of regular exercise. What's the good news? Over the last ten years, studies have shown that regular exercise can provide immediate benefits to the way we think, therefore enhancing on-the-job performance. Consider the following cognitive benefits: enhanced concentration, creativity, learning, memory, mental stamina and mood, as well as lower levels of perceived stress. All of these benefits can directly impact a person’s productivity, time management, ability to build interpersonal relationships and foster collaborations at work. There is also evidence that exercise during regular work hours may boost performance. No matter how busy we may be at work, human beings make time for the things that they value. If you can’t create a 25th hour in the day to exercise, what can you stop doing, or do differently, to create that time? The YMCA can help support you in this healthy habit. Visit your local branch for inspiration. The YMCA of Greater Boston welcomes George Gilmer to its General Board of Directors. George is Managing Director and Head of U.S. Asset Servicing for BNY Mellon Asset Servicing. He joined Mellon Financial Corporation in 2003, prior to Mellon's merger with the Bank of New York. Previously, George worked at JP-Morgan Chase as CFO for the Securities Processing and Fund Servicing line of business. George received a Bachelor of Science degree in Accounting from Westfield State University and a Master of Business Administration degree from the University of Rhode Island. We look forward to his leadership for the YMCA of Greater Boston. The Burbank YMCA was pleased to participate in Comcast Cares Day on Saturday, April 25 and welcomed 12 Comcast volunteers who completed a spring cleanup of the branch. The YMCA relies heavily upon the time and talent of volunteers to guide our cause-driven and we are fortunate to be supported by our town and elected officials, neighbors and local corporations, like Comcast, who donate their time. Over 100 volunteers spent the week of April 11-17 painting, sanding, building out walls, adding bookshelves and storage areas and installing a new floor to three rooms of the Egleston YMCA. The project was funded with a grant from Kimberly-Clark. The labor force came from skilled workers of the Gilbane Building Company and United Way of Massachusetts Bay and Merrimack Valley.